When it comes to the future and fabric of a community, there may be nothing more crucial than education. The Independence County Public Education Foundation was formed to address the importance of K-12 and continuing education for improving quality of life and bolstering economic prosperity in the region. At a time when financial barriers to college and low age jobs pose significant challenges for American families, the Foundation has worked in conjunction with the IMPACT initiative for excellence to bridge the equity gap in Independence County. The resulting Independence Promise scholarship program will provide widespread access to higher education for students throughout the county. In July of 2018, the Public Education Foundation met with area school, community, and business leaders to publicly announce the launch of the new program, which had already begun accepting applications for the upcoming semester. The group celebrated this highly collaborative achievement, remarking on the positive change it will bring over time. Independence Promise will support students in transitioning from high school into higher education and vocational training by offering financial aid for concurrent classes and career exposure opportunities. Two different local institutions, UACCB, a two-year community college, and Lyon College, a private liberal arts school, joined the cause with full support and helped develop the plan. Both welcomed the increase in enrollment and the added connection to the community that will be established. The program is designed to help students begin college coursework before graduating high school. It aims to engage students early on and shorten the time from high school to entry into the workforce, while removing barriers which threaten to limit students’ economic prospects. Exposure to the collegiate experience places young people on the path toward degree completion and motivates them to think beyond high school. 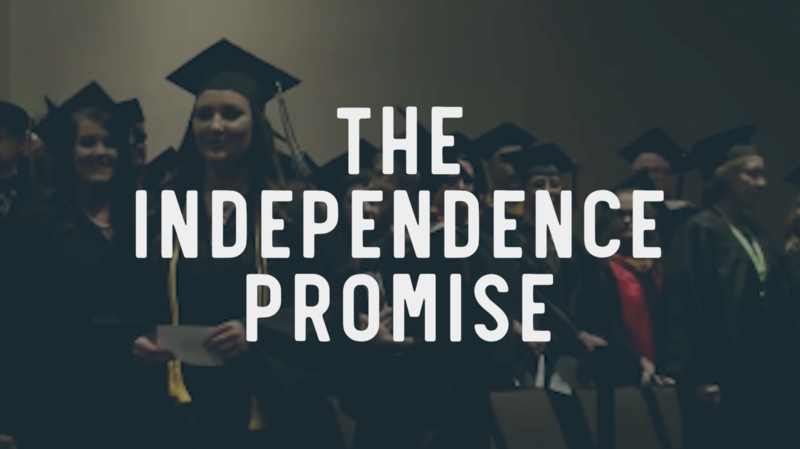 For students who many not have considered attending further schooling or educational training, the Independence Promise plays an essential role as a gateway to the many options available through higher learning. With this plan, students can see the cost of their postsecondary education dramatically decreased or eliminated. Though concurrent classes and internships are not entirely new, the Promise plan greatly expands on the purpose, availability, and effectiveness of other models. A key aspect of the plan is that the Foundation raises private funds from which to share the financial responsibility of the education and training opportunities. This type of unique collaborative, cost-sharing model has been found through studies noted by the Arkansas Bureau of Legislative Research to be most effective for helping students successfully completed courses. By establishing this fund, the Foundation expects to support students who mutually promise to apply their best academic efforts in seeking to extend their education or training beyond that provided by the school systems of Independence County. Students who meet the minimum requirements for standard achievement tests and GPA are eligible, and they are further required to maintain good attendance, make a “C” average or better, and direct their efforts with a plan toward career or college by taking transferable classes. After the school district pays 20% for up to two courses per semester, the student’s fee is determined by his or her national lunch status, which is based on household income. Many families will pay as little as $40 for three credit hours. The remaining costs are fully covered by the Promise scholarship. The Independence Promise will make it possible for students of all economic backgrounds to achieve their dreams. Before the program had even launched, the Foundation had collected over $180,000 in funding from businesses and donors who believe in the goal to promote the best interests of individuals and the region. ForwARd Arkansas, a partnership comprised of the AR Board of Education, the Winthrop Rockefeller Foundation, and the Walton Family Foundation, made $16,000 in community funding available to a local Fast ForwARd Fund Committee which allocated all funding to the Promise program in recognition of this long-term endeavor to make the community more equitable and prosperous. By creating an environment that supports access to higher credentials locally, residents can expect to see an increase in higher living wages and more specialized labor among the population. With enthusiasm and pride, the county looks forward to the contributions that its young people will bring to the area in years to come. Independence Promise from Ariel Carpenter on Vimeo.